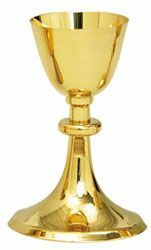 Gold plated, height 8", cup 3 3/4" base 5 1/4". Cap. 10 oz. with 5.5" scale paten.